Duncan Jolyon Burden has posted to his blog an entry titled "GEOMETRY IN ARCHITECTURE AND ART - PART 3"
In his blog post Duncan rehearses his discovery of a geometric christogram of three classic geometric shapes found by him in a last-course painting by DAVID TENIERS II called "St. Paul and St. Anthony in the Dessert". I have decided to investigate Duncan's shape-sifted seal in this saintscape and see if its existence is a solid certainty, or a smoke with no fire. Artwork by David Teniers II. Dread geometry by Duncan Jolyon Burden. Duncan's use of thick, bold lines, to high-light the geometry, thought perhaps, by the reader, to have been used by Duncan to help the reader to view the geometry, can also hinder the readers ability to view and judge the veracity of Duncan's divined device. In the image that I have borrowed from Duncan's Blog, you can see that in Duncan's final example, the square is stretched vertically, and is not a square of sides of equal length, and its thick lines are coloured a bold and attention grabbing yellow. So the square is out? So what? Accidental? Or developed deliberately by the devising geometrer to distract the reader with a big yellow square? 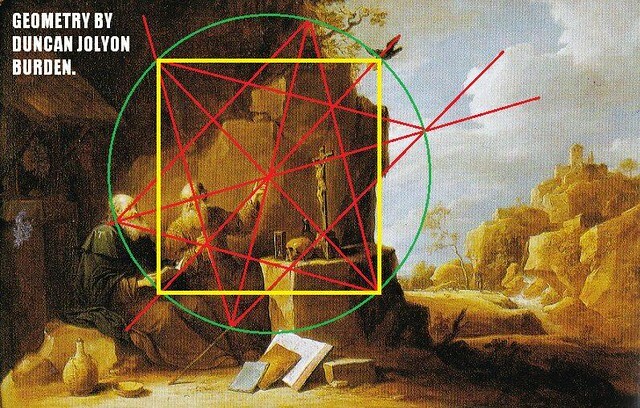 Let's now investigate Duncan's plane sight solution to Teniers II's painting "Raven With A Bun". In this painting by Teniers II, Duncan has set his Tilted Geometry of a circle, a triangle, and a square, placed in occultation. The equilateral triangle has a vertex, or corner, locked to the top-left corner of the square. From this corner, the triangle swings to the right to overlap the square. The edge, or side, of the triangle opposite this vertex, forms a diagonal line through the square, that bisects the two adjacent sides of the square, through the centre of each side. This arrangement of the triangle and square mean that the height and breadth of the square in the painting can be easily determined, and the perimeter of the square quickly found, and Duncan's geometry imitated. In Duncan's Tilted Geometry, Saint Paul's index finger is the centre of the shape of the square and the triangle. The saint's rested staff marks the diagonal edge of the tilted triangle. The diagonal edge of the triangle bisects the bottom edge of the square directly below the centre of the square. If a vertical line is drawn from the tip of the index finger, which is the centre of the square, down to the staff, this line will be half the height of the square, and therefore half the breadth of the square. The length of each side of the square will be twice the length of that line, and the line falls directly on to the middle of the bottom edge of the square at the staff. By following these steps, the reader can replicate the size and location of Duncan's square, and the circle the square is bound by. Artwork by David Teniers II. Geometry by ME, after Duncan. Why did you post this here instead of posting directly on D's blog? OOOPS! It seems that I did it wrong! I'm certain that I created the square that was intended, but the edge of the circle that bounds the square does not go through the intersection of the two staffs! It goes through the raven's wing, but not the staffs! This is not good news. Oh well, I suppose that I should try to draw in an equilateral triangle. In red! I have had some success! I locked the vertex of the triangle to the top-left corner of the square, and made sure that the far edge of the triangle ran along the resting staff! The triangle is equilateral! And yet... the left edge of the triangle does not run down the gripped staff that intersects the resting staff! To be honest, I don't think that the edge of the triangle would, even if it were shifted towards the raven. The angle looks off. I drew another triangle by running the left edge of the triangle down along the gripped staff instead, but then the far edge of the triangle missed the resting staff, and I got an isosceles triangle! This is terrible! How did Duncan use both staffs and yet get an equilateral triangle locked to the top-left corner of a square made using the same internal measurement that I also used, and bound by a circle determined by that square? If only I had studied drawing on other people's artwork at a university level! I present both of my attempts again, wrought in thick line, so the reader can more readily see my geometry, and compare the results of my application of Duncan's geometry with Duncan's geometry. Here again is Duncan's example. In Duncan's example, you can see that the bright yellow square is not only stretched vertically, but you'll find that it is also compressed horizontally, and that his circle is compressed vertically. If you look attentively, you'll also see that the internal red hexagon created by the overlapping triangles, looks a bit... irregular. Not because the triangles are not equilateral, but because they have been improperly centred! I attempted geometry, and Duncan attempted geometry, and some geometry was not attempted correctly. 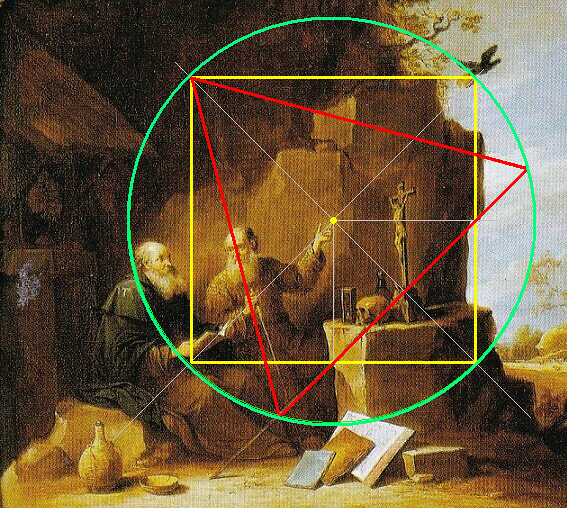 I hope that the reader will attempt to replicate Duncan's geometry for themselves, and correct me if I'm wrong, but I do not think that Duncan Jolyon Burden's geometry has a line drawn under it in this painting. Why aren't you using D's own blog to show 'your' version of 'his' geometry? Why post here, when the 'masons' interested in D's blog may not even know that Tweleve exists? What's with all this 'your' and 'his' in single quotation marks? I'm not D so how can I use D's own blog to show 'my' "version" of 'his' "geometry" to 'masons'? It's a BLOG! And it's not MY blog! Oh wait! Your question is a trick question! You mean, why don't I post it in his blog's private ACCESS MASON ONLY AREA that is restricted to Freemasons only? Yes, why don't I post my research into the validity of his geometry, in a restricted forum where non-Freemasons are not allowed to read or see it? No trick Ruby. D's Blog has a comments section where people like yourself can post. Is that not obvious from the comments already on D's blog? Surely you saw those? So why haven't you posted comments on there? Even if D's blog doesn't cater for comments with images, you could always post you text and then link to an external image store to show your version of the geometry. Is that difficult to comprehend? So, not a trick question then. No, I gave you too much credit. A STUPID question. A VERY, VERY STUPID question. The comments section on a personal blog isn't like making posts in a thread on a forum. Duncan has to approve any comments made by anyone before they appear on his blog. If you've ever made a comment on there, it should be obvious. Oh wait, you have. Why are you all hot under the collar about whether I post to his blog or not? I'm not hot under the collar at all Ruby - you always get things wrong. It just seems odd to me that you post here making comments about what D is doing elsewhere - where there is an opportunity to post on D's site itself. So what are you then after 'public' recognition or simply explaining to D that you think he's wrong? As if, you're not after recognition, then it matters not a jot if they appear on his blog or not does it? So, if I write about an "AMAZING SPIDER-MAN" Marvel comic, I should put what I wrote on the Marvel website? Or, if Duncan didn't have a blog, I should have put what I wrote here, into an envelope and mailed it to him? Duncan didn't have a blog. Now he has a blog. In the future, Duncan may not have a blog. So why would I post to a blog that he may decide to delete in two weeks time? Or have you forgotten what seemed to us to be the abrupt and highly un-professional end of the MARANATHA Competition? Recognition? I sure that no-one else is reading this thread. I think that the 85 views it has had up to now are all just you. So, if I write about an "AMAZING SPIDER-MAN" Marvel comic, I should put what I wrote on the Marvel website? I think that you see the difference between your analogy and what I am saying. Or, if Duncan didn't have a blog, I should have put what I wrote here, into an envelope and mailed it to him? But D has a blog so we're not talking hypotheticals are we? Duncan didn't have a blog. Now he has a blog. In the future, Duncan may not have a blog. So why would I post to a blog that he may decide to delete in two weeks time? Why post then on any transient medium? It depends on what your goal was really doesn't it? If you want D to know that you disagree with that part of his theory, then D has a blog and an EMail that you can now post to. If you want to show others (other than D) that you disagree, then fine post whereever you think your target audience is. Or have you forgotten what seemed to us to be the abrupt and highly un-professional end of the MARANATHA Competition? I thought the company went bust didn't it? Or have you (and aren't you the spokesperson of PPubs? - so you should be aware of the background to its demise) another version of what happened?